I’m on the Istar tonight and tomorrow, headed for Romania. I arrived at Keleti station nice and early, and my plan was to buy provisions and have a quiet beer before boarding the train. Some of the station food options looked a little scary on the food hygiene front, so all I ended up with was a cheese roll. In finding the sandwich shop I also discovered that under the station there is a migrant encampment, with people living in tents behind wire barrier fencing. Everything looked peaceful, but nonetheless a reminder of the difficult times we live in. Back in the main concourse I found a run down bar and treated myself to a Dreher beer. This was a big disappointment as it had the aroma of washing up liquid and quite an astringent taste. I didn’t have time to identify if it was the glass or the beer, but I wouldn’t drink that again. When I asked the concierge at my hotel about local beer he told me to stick to wine. I think he might have been right. I could not understand much of the departures board. It’s a sign I’m getting to the margins of the part of Europe that I know. 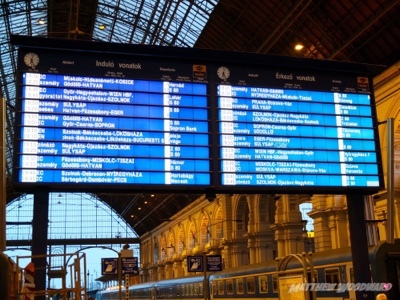 I could however read the word “Bucharesti”, and headed for platform 7 about half an hour before departure. From what I can see it’s an all Romanian train, and I’m in the only sleeper carriage, number 422. There is also a couchette carriage next door, and beyond that a restaurant carriage. That’s a good sign, and it’s staying with us for the whole journey. Up front there are several more seated carriages. This is a much longer trip than the “Kalman Imre”, leaving Budapest at 19.05 and arriving at noon the next day in Bucharest. Once again it’s a train going to more than one destination, and only part of it is going to Bucharest. My first impressions are that its the perfect train for me. It’s modern, clean and I have time to relax this evening and no dawn arrival. There is, however, an immediate problem after we depart. It’s a minor point, but apparently I have no ticket. 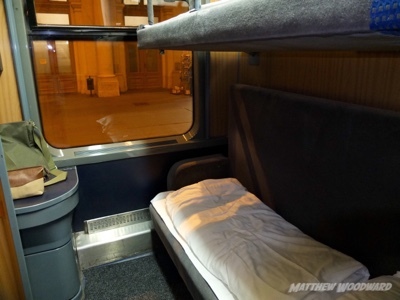 The person at SNCF who sold me a ticket has actually just sold me a bed reservation. I put my peaceful and positive hat on with the steward and we came to a special arrangement. I’m relieved that he’s a good chap and speaks pretty good English. Another minor hurdle in the mission quickly solved. It’s my fault for not spotting that this ticket said just “reservation” and not “ticket and reservation”. I didn’t spot it as the three other tickets SNCF sold me were fine. I did smile tonight when I heard the station announcer declare that “optional seat supplements are obligatory on this train” Glad that’s clear then. I had a picnic in my compartment consisting of my cheese roll, some pretzels and a rather fine Hungarian red wine made in a Portugese style. In a schoolboy packing error I forgot my plastic collapsible wine glass, so I purchased a plastic cup for 20 Florints. I seem to be rapidly turning into an InterRail peasant. A morning update. I have woken after some reasonable sleep in a pretty comfy berth. After assuming that there would be no border formalities, I was glad that I hadn’t gone to bed, as an immigration officer knocked on my door at just after midnight. Romania may be in the EU, but this is the end of the Schengen zone. My passport was scanned on the Hungarian frontier, and then we made a short hop into Romania, where a policeman just checked my passport and copied a few details by hand into his notebook. I worked out there was a one hour time change here too, so turned in just after 01.30am. It was a noisy night with lots of tooting and horn blowing and a few engine changes, but the ride is very good and the line is mainly straight. No suicidal breaking on this train. I headed to the restaurant carriage for breakfast. Sadly it’s a fairly dead place, and the only thing buzzing were the flies. I had a luke warm thick black coffee, but didn’t linger as the windows were to dirty to see out of, and the views of the Carpathian mountains were quite good. The staff were friendly enough, but chef didn’t seem too keen to cook anything. Most of the other travellers got off at Brasov, no doubt off for some Count Dracula based tourism. The scene outside at first is of bare rock mountains, old steam engines, and wooden buildings, but this changes to chicken factories and petrochemical plants as we pass the open plains nearer to Bucharest. We arrived in Bucharest Nord on time and I said goodbye to our excellent steward and also to the well travelled passenger in the next compartment, who by chance was English. My mission now was twofold. 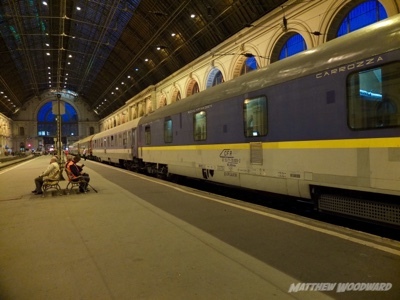 Firstly, not to get scammed (me, get scammed in a Romanian railway station?) and secondly, to see if I could get some onward tickets to take me to Istanbul, the next leg of my Orient Express journey. I’m pleased to say that I succeeded on both counts. After queuing at the ticket counter and fending off several people who didn’t believe in queuing, I realised I was at the wrong ticket office. Never mind, I’ve done that before. When I finally found the hidden international ticket office, I got to speak to a younger and very slightly more friendly ticket lady through a little hatch. I had written my cunning plan on a card, so I just handed it over and let her read my transportation requirements. I’m clearly not the first to make such an audacious request as she immediately passed back a bit of paper telling what I knew, that the journey to Istanbul is currently using two trains and two busses and takes at least 18 hours. I smiled and told her that this was indeed what I wanted, and once she had done her best to talk me out of the idea, the booking was made without fuss. It cost 195 Lei, about £38, all major credit cards accepted. Happy to have this done I then prepared myself for the station tourist taxi scam again, but with renewed determination and confidence in my ability to win. Bucharest station is world class in taxi scam leagues, and some would be horrified that I was attempting to get a cab without pre booking it. First the touts came, then the feeders, then the fake porters – they all converged on me and I swatted them off one by one staring ahead and making random swerving manoeuvres. Finally I came face to face with the kingpin, the commission tout himself, on the taxi rank. I ignored him and tried my first cab. He refused to take me. 1-0. The second cab wanted a fixed price, so I moved on, 1-1, and I got into the third cab before the tout could get between us. My fare was on a meter and about £3.50 for a 15 minute downtown journey. 2-1 to me. I have a couple of days here to recover and prepare myself for the next leg. Great reading Matthew, I think we may try this journwey sometime in the not too distant future! Thanks for all the descriptions! Loved reading it. 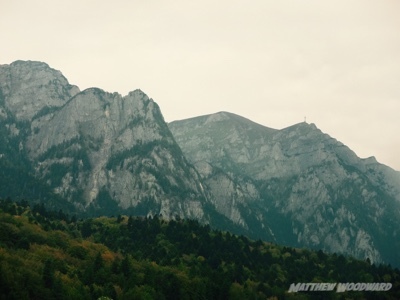 We plan to go from Vienna to Romania next year, and your blog helps us to prepare for the trip. It's good to know what to expect!